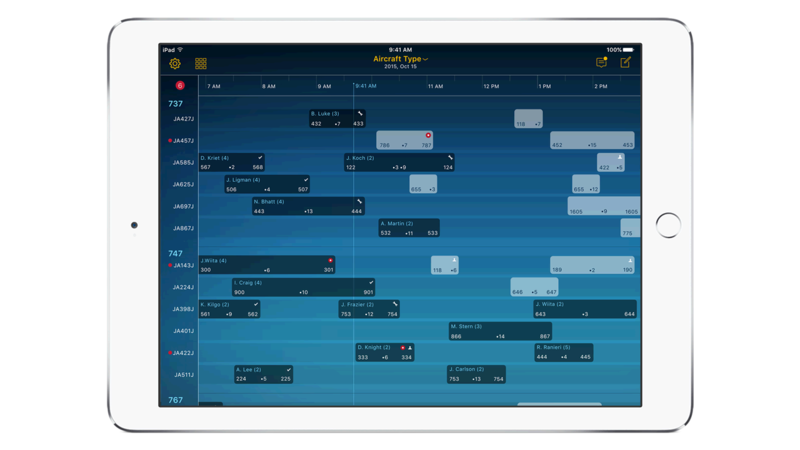 IBM Mobilefirst for IOS Assign Tech gives aircraft mechanic supervisors a streamlined dashboard on an iPad of all flight schedules and maintenance status. IBM Mobilefirst for IOS Assign Tech gives aircraft mechanic supervisors an intuitive, streamlined dashboard on an iPad of all flight schedules – and the status of ongoing maintenance. It also shows the availability of parts, recommends the most qualified engineer for each job and provides push notifications on any flight delays. Supervisors are more equipped to proactively manage current maintenance activities so they can optimize costs and minimize delays. This automated collection and analysis of machine flight data enables proactive troubleshooting and sharing of mechanical expertise at the point of service. Use app analytics for repair times, required parts and tools and information collected in-flight. Optimize job assignments through analytics based on engineer qualifications and availability. Improve communication among departments and access expert support when needed through FaceTime. Quickly receive and act on push notifications about job status, schedule updates and urgent issues.